Hundreds of independent writers, artists, and activists are claiming credit for an elaborate project, 6 months in the making, in which 1.2 million copies of a "special edition" of the New York Times were distributed in cities across the U.S. by thousands of volunteers. 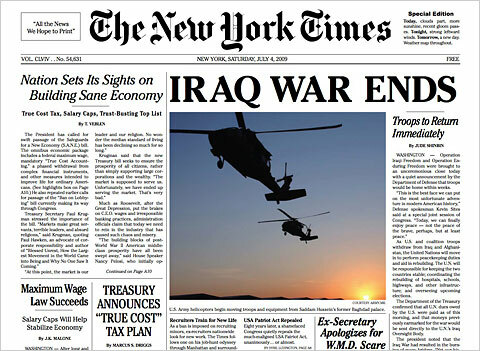 The papers, dated July 4th of next year, were headlined with long-awaited news: "IRAQ WAR ENDS". The edition, which bears the same look and feel as the real deal, includes stories describing what the future could hold: national health care, the abolition of corporate lobbying, a maximum wage for CEOs, etc. There was also a spoof site, at http://www.nytimes-se.com/ . "We wanted to experience what it would look like, and feel like, to read headlines we really want to read. It's about what's possible, if we think big and act collectively," said Steve Lambert, one of the project's organizers and an editor of the paper. "This election was a massive referendum on change. There's a lot of hope in the air, but there's a lot of uncertainty too. It's up to all of us now to make these headlines come true," said Beka Economopoulos, one of the project's organizers. "It doesn't stop here. We gave Obama a mandate, but he'll need mandate after mandate after mandate to do what we elected him to do. He'll need a lot of support, and yes, a lot of pressure," said Andy Bichlbaum, another project organizer and editor of the paper. The people behind the project are involved in a diverse range of groups, including The Yes Men, the Anti-Advertising Agency, CODEPINK, United for Peace and Justice, Not An Alternative, May First/People Link, Improv Everywhere, Evil Twin, and Cultures of Resistance. You may have seen The Yes Men in The New York Times recently ― they made the July 4, 2009 issue. If you didn't catch that one, follow the link. Their verve to draw attention to the most destructive players on the global scene (WTO, Exxon, Dow, and the eceteras) moved me to contact them for interview. I was very happy to read these responses and thank them for their time and professionalism. Why are you called the Yes Men? You know how a funhouse mirror exaggerates your most hideous features? We do that kind of exaggeration operation, but with ideas. We agree with people ― turning up the volume on their ideas as we talk, until they can see their ideas distorted in our funhouse mirror. Or that's what we try to do, anyhow ― but as it turns out, the image always seems to look normal to them. Can you describe a dream scenario for the Yes Men―something too good to be true, but one you'd jump at if you at the chance, and what you'd do? "Greed has poisoned men's souls; has barricaded the world with hate; has goose-stepped us into misery and bloodshed.... Even now my voice is reaching millions… victims of a system that makes men torture and imprison innocent people.... Soldiers! Don't give yourselves to brutes, men who despise you and enslave you.... Soldiers! Don't fight for slavery, fight for liberty."